I love that this is a dish I can prepare in advance or the night before so that come morning, I can turn it on and let it go. By the time we get home from work, dinner is on the table! 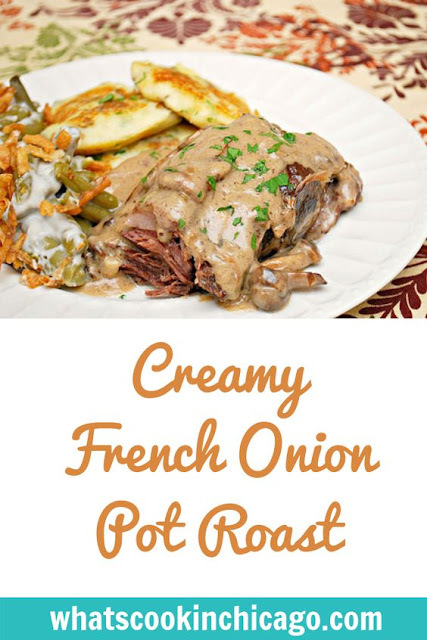 For those who are nervous about leaving your crockpot on at home while you're away or with no one home, you can also just cook this overnight and turn on the crockpot just after dinner or even before going to bed... and come morning, you can set it aside to cool, chill and have it ready to heat up for dinner. This dish also makes great leftovers - perfect for sandwiches and even in a soup with pasta or potatoes. I try to double up on the recipe just for leftovers because the flavors are soaked into the meat, making it even tastier the next day. In a cast iron skillet over high heat, add 2 tablespoons oil. Sauté mushrooms until browned and transfer to crockpot. Meanwhile, season chuck roast with salt and pepper to taste. Add remaining oil to the skillet and sear roast on both sides in the now empty hot skillet until browned; transfer to crock pot. In a bowl, whisk together the cream of mushroom soup, dry onion soup mix, and chicken stock. Pour over roast in slow cooker. Cover and cook on low for 8-9 hours or on high for 3-4 hours. Remove roast from pot and stir remaining sauce. 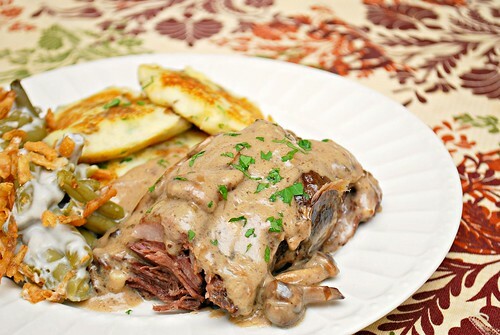 Serve slices or pieces of roast with sauce from crockpot and garnish with fresh parsley. That is serious comfort food. I'd love a plate for breakfast!